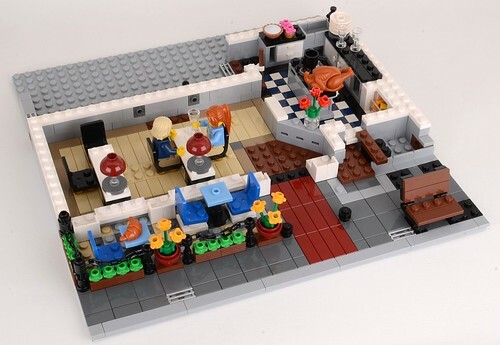 The fantastic folks in the LEGO community team have sent us, and other fan sites, 10243 Parisian Restaurant to review ahead of its release in January. It's not often we receive sets, and are able to post reviews, so far in advance of release, but I'm certainly not complaining. 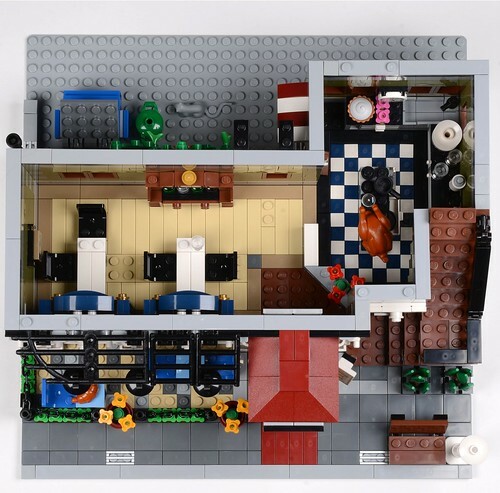 When the set was announced at the beginning of October it generated a lot of interest and positive comments, with many regarding it as the 'best modular yet' which is saying something given the high standard of recent ones. I received it on Wednesday and spent yesterday building the ground floor. This review then, will be in several parts. Today I'll cover the ground floor, and hopefully later today or over the weekend I'll get the other stories built and the review concluded. 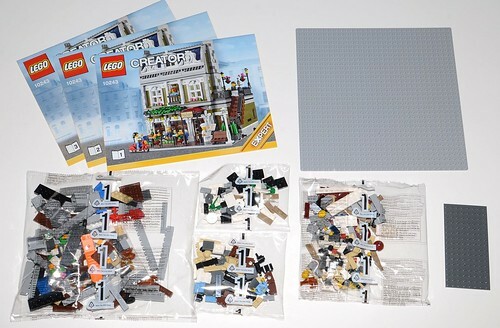 As you will see, this is not a set to rush: plan to spend at least 6 hours building it. The ground floor took something like 3 hours to complete because the level of detail is astonishing. 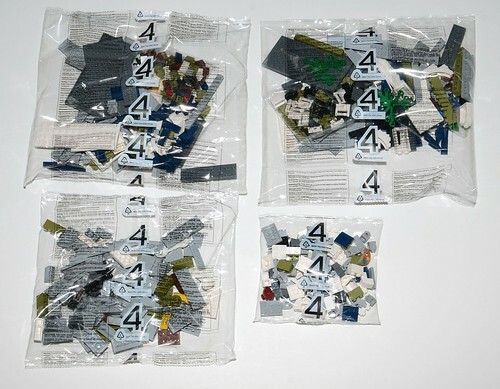 The bags are, thankfully, numbered 1 - 4. Bags numbered 1 and 2 build the ground floor, bags numbered 3 the first-floor, and bags numbered 4 the roof. There are three instruction manuals and NO stickers: everything is printed. 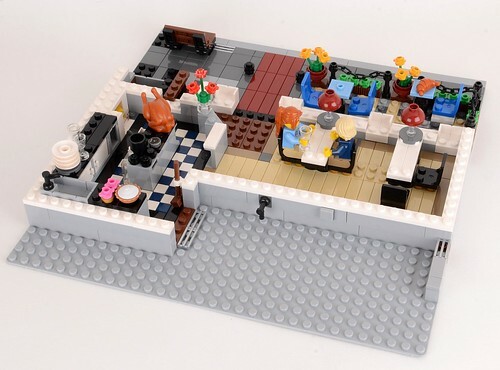 The baseplate is light grey which is not usual for modulars, is it? 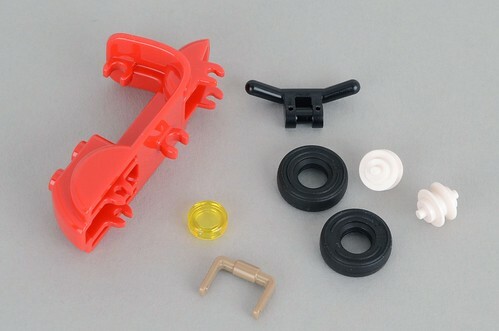 The set features four new parts. I've taken photos and sent them to our resident new parts expert, caperberry who will be publishing something about them later today on his blog New Elementary. 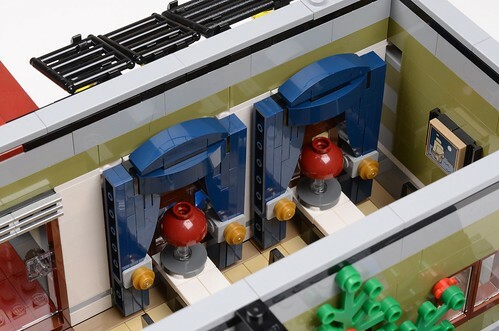 It's not usual for modulars to have new parts and I think we can be sure that they were not made specifically for this set, but will appear in other 2014 sets. 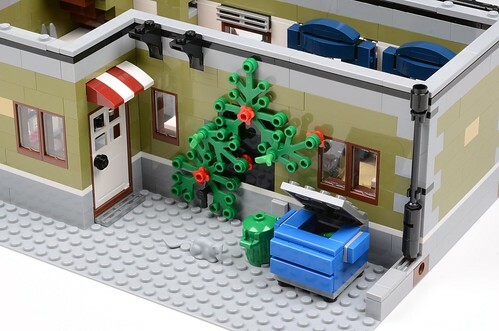 There are about 300 olive green parts in the set, including 209-bricks in sizes 1x1, 1x2, 1x3, 1x4, 1x6 and 1x8, so it's now a viable colour to use in your own MOCs which will please a lot of people. The scooter is a new and arguably long overdue part. Here are its component parts. Using a bucket handle for the kick-stand is a stroke of genius. This is what it looks like assembled, with one of the five minifigs riding it. Incidentally, she's wearing an oriental patterned top which is not one I'm familiar with but I guess it's from Ninjago. The set features four other minifigs. 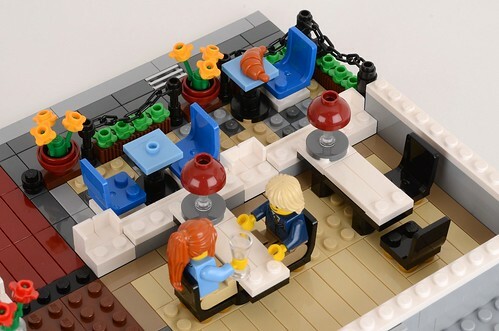 The minifigs are never the reason to buy modular buildings but once again Jamie has given us five figures that are interesting and bring the set to life. On the right, we have who I guess is Albert (whose name appears above the door) himself, a waiter, and on the left, two customers. Note that in common with those in other modular buildings, they all have classic smiley heads. Construction begins at the base of course, and it takes a good half hour to get to this stage given the number of 1x1 plates and tiles, which take time to align. Note the 'Chez' pattern in the outside seating area. 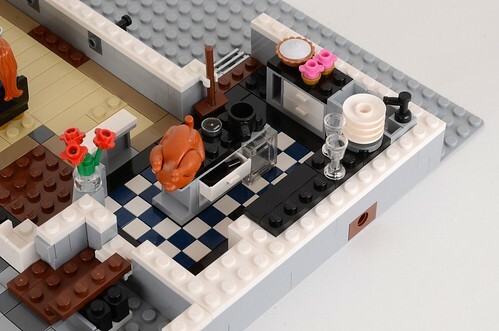 This is just one example of the attention to detail that's gone into the set. Once the tables and chairs have been placed, you can't even see it. Bags #1 completed. The kitchen and 'front of house' are taking shape and the outside seating area is complete. Two of the new pieces are evident in this shot: dark grey 2x2 round tile with hole in the middle and a 2x2 upside-down cone in dark red (ironically being used upside down here!) which together with a upside down bottle, make the table lamps. The kitchen is packed with great features including a sink (note the drain pipe under it), cooker, fridge (taking shape on the right, with two piece of cheese in it, cupboards and drawers. Note the 1x1 round tile printed with a 'cooker control' pattern. 'Front of house' can seat four people downstairs and three outside. Bags #2 complete the ground floor. There are so many cool features: the 2x2 tile showing the menu, the printed 'Chez Albert' tile above the door, the use of a gate above the outside seating area with lamps suspended, and the Aloe-style plants in pots by the stairs. The white pillars between the windows and doors are very cleverly constructed and you will enjoy building them and seeing how they are made. Expect to see more close-ups of the details when I've finished building the set. Inside, on the back wall, is this superb sideboard with wine bottles. It can't be lifted out from the model to be photographed; it's an integral part of the back wall. The curtains, which fit neatly round the two tables, are very well done, and come complete with pelmets and tie-backs. The back yard is well detailed. The black bricks hidden by a climbing plant are the back of the sideboard, but the plant does a good job of hiding them. The blue food recycling skip, full of bits of cheese, sausages and bones, is cleverly made. A green dustbin and rat complete the scene. Now I'll get on and build the rest of it. Stay tuned for more! I have been avoiding modulars (mostly because I missed the first 4) but the level of detail in this just looks superb. It will look great next to my 10181. Excellent review and pictures, Huw. I am in awe of this model. So far I can see nothing I would change about it (the plumbing under the sink is a level of detail which I have never experienced in a set before). I only built the Pet Shop yesterday and was impressed by that, but this is another level altogether! I look forward to the next part, many thanks for the review Huw, and to LEGO for providing it so early. You lucky, lucky, lucky so-and-so! These details are wonderful! Now I should find money for it and then place where to keep it...) Probably really the best modular, since the fantastic Green Grocer; but this one has even better combination of interior detailing and architectural beauty of the whole building. Could you possibly post scans of the set inventory, so we canbegin harvesting part numbers and quantities? That would be a boon for those of us thinking of building possibilities with these parts. 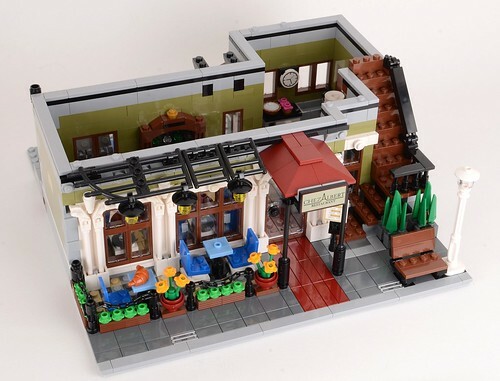 I was saying that this is be my second modular set after the townhall. Thank you for the fantastic review. I don't think there has ever been a more beautiful set. I'll have to get 2. Better start saving up. The bags are properly divided between the floors, how about the books? Could three people work on this simultaneously? I work of the Winter Village stuff with my grandson, and it's frustrated me that I can't give him the book of small stuff to work on one thing while I work on larger pieces, until this year. It would be great if other large sets like this that have defined sections could be worked on by more than one person. Looks like I will be snapping this one up...especially if there's ever an opportunity to get it on sale. @McBuddha I haven't found one yet! @jditoro3, Yes the books are one per floor. I think I will have to try and buy this one, it just looks too good to miss, plus with budget I can only really buy every two years anyway. Using cheese slopes as cheese ... now there's innovation! Can't wait to get this. Great pictures as always, Huw. 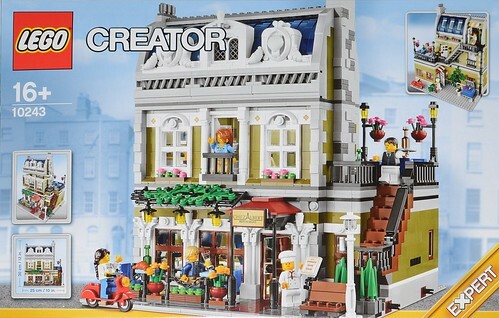 Can't wait to get this set, its spectacular! Huw, you left out the plants on top of the front railings! This is definitely my favorite Modular so far… the level of detail is superb, due to budget I could never afford to buy an Modular, but I might try really hard to get this one. Great review, many thanks! So looking forward to seeing this available! But the cook's name is not "Chez Albert", as "Chez" is French for "At" like in "At Albert's". So he's just Albert (or Al to his friends...:-). I might be wrong but I'm pretty sure the Fire Station modular had similar plumbing under its sink. And I love the cheese wedges being cheese wedges, are they different shades too? One looks darker, I imagine it's the Chima lion-yellow shade (Red Leicester compared to Cheddar?). 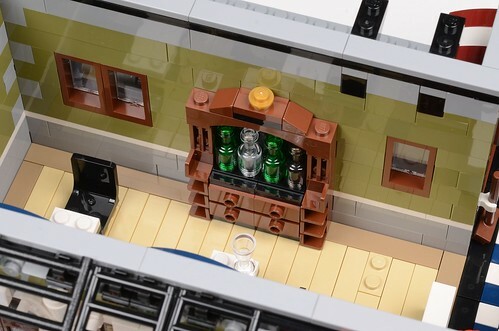 The wine-filled sideboard remind me of the MOC furniture that LDiEgo put on Cuusoo for Cafe Corner and Market Street (Brixe has some great stuff too that makes me think of Ikea! ), Jamie is a real AFOL isn't he. From the pictures I think you're spot on and I can't wait to get it myself, the level of detail looks stunning and the cumulative effect of all the little touches is what makes it so good. I can't wait for part two of the review either! Great review Huw! I will definitely be buying this set. Does anybody know if it will be available on a VIP early access before christmas? ^ I would imagine so, as the other Creator Expert sets have been on VIP pre-release. Probably around December 16th/17th to VIPs enough time to order and receive it for Christmas. 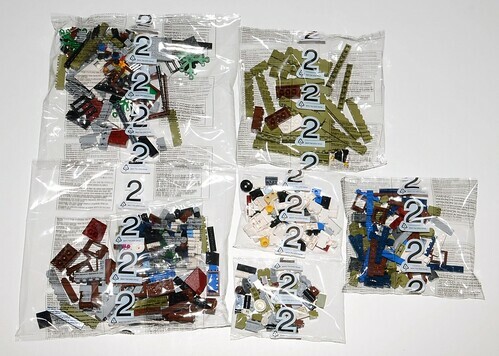 I dislike how there as so many NUMBERED bags. It is better when there are fewer numbers, and therefore a larger and harder build. You COULD combine the bags, say two at a time. But when you finished the first one it would be like you just have ONE numbered bag opened. Lego is starting to decrease the difficulty level on modulars, sadly! @bokbokbokchoy - That depends entirely on how you define a difficulty range in LEGO products. The actual building techniques used should be more of a gauge than how accurately/quickly you can find a particular brick. ^^ It's a challenging enough build as it is without having to spend 4x the time sifting through thousands of parts. Where's the fun in that? The model is now complete, I'll post the remainder of the review tomorrow. The chef's name would be just Albert, not Chez Albert. 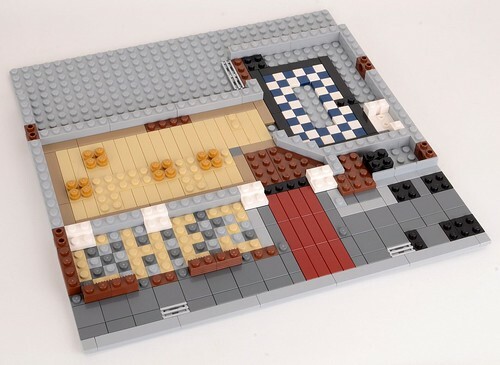 Chez means 'at the home of'. The English equivalent of Chez Albert would be something like "House of Albert","Albert's Place", or simply "Albert's". Thank you for everyone who pointed that ^ out. It's an odd thing to have as a floor decoration then, isn't it. 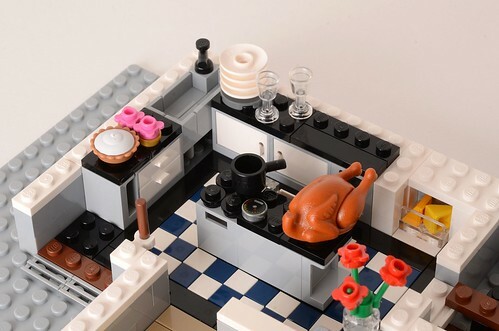 This has got to be one of the best modulars since the green grocer! Can't wait for part 2 of the review. A quick online search for "Chez Albert" shows that it is the name of a French restaurant in Massachusetts, USA, which just happens to be Jamie Berard's home state. It may be a coincidence, but knowing Jamie's affinity for subtle detail makes this a curious observation. Very cool, I can't wait. But I'll probability wait for double VIP in the spring to buy. 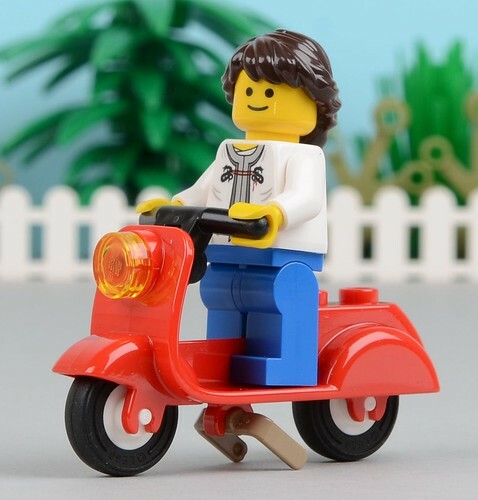 Any notice on the back that Lego has started a new block? Cant wait to add this set to our inventory. I wish I had the older Modulars as well, but we got a late start on collect the modulars. 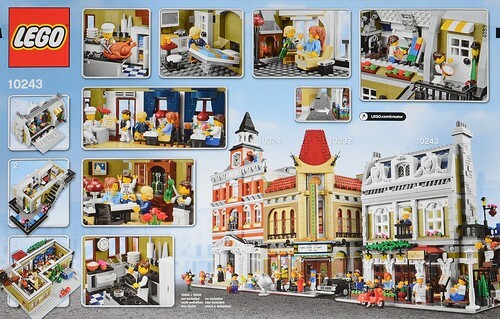 Out collect now includes, cinema, fire house, town hall, grand emporium, and the pet shop.